Alabama's front seven looks to remain strong in 2016. Alabama got a big boost over the weekend, as junior defensive lineman Jonathan Allen announced he will return for the 2016 season instead of declaring for the NFL Draft. Allen led the Crimson Tide with 12 sacks in 2015. Allen also lead the Tide in tackles-for-loss with 14.5 last season and made a critical stop by sacking Joshua Dobbs late in the fourth quarter against Tennessee to seal a victory. 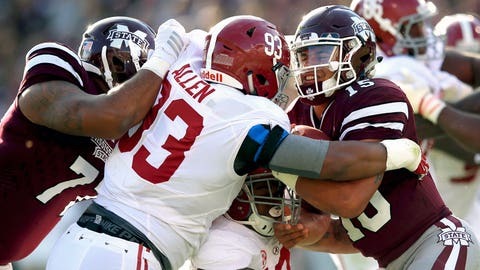 Allen received a second round grade from the NFL Draft advisory board and will now have another season to enhance his college stock in Tuscaloosa. With A’Shawn Robinson gone to the NFL, expect Allen to be the focus of opposing offensive lines next season. If the senior can continue to lead the Tide in sacks and tackles-for-loss, expect to hear his name called in the first round of the 2017 NFL Draft next spring.